Number of Languages sung in 16 (Tamil, Telugu, Kannada, Malayalam, oriya, Konkani, Tulu, Bengali, Hindi, Konkani, Baduga, Gujarathi, Assameese, Malay, Sinhala and Bojpuri. Other activities singing Gazals, Mythological songs. Instruments known to play Harmonium, Keyboard, Accordion. Address No.64, Radha Avenue, Valasarawakkam, Chennai-87. Mano is a south Indian famous playback singer. 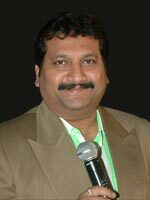 He sings in Telugu, Malayalam and Tamil.His original name is Nagur Babu. His voice resembles that of more famous S P Balasubrahmanyam. The year was 1994. The song on everyone's lips was `Muqabla Muqabla' from the film ``Kaadhalan, (music by A. R. Rahman). Suddenly everyone was talking about playback singer Mano who had finally arrived and hit big time. For Mano long considered a clone or carbon copy of S. P. Balasubramaniam the song proved to be the turning point of his career and gave him a well deserved break. There has been no looking back since then and hit after hit followed with ``Thillana in Muthu, (music by A. R. Rahman,) and a string of hits in ``Ullathai Alli Tha ```Azhagiya Lailaa, I love you love you, ``Adi Anarkali. Music by Sirpi. With a track record of 16,700 songs in 15 languages Mano with his robust voice, that has body, that emanates from his lungs and traipses across the octaves with effortless ease, not to forget a range and versatility that is amazing is currently riding the crest of a wave of success. About the songs in ``Ullathai Alli Tha Mano says ``Sirpi tried composing something different and all the songs have become hits. Some of the songs like the `Azhagiya Laila' have an Arabic flavour reminiscent of the `Aye Shabbha' song which I did in ``Karna under music director Vidya Sagar. Mano believes that the success of a song depends to a great deal on team work. ``Even if a rhythm box is missing it will affect the song. Before singing in a changed voice we must make sure it is suitable for the situation. If we try doing that in a melodious song like `Oh Priya' it will spoil the whole song. It will amount to making fun of the song. Asked if he expected `Muqabla Muqabla' to become such a tumultuous success, Mano says ``Rahman asked me to do something different by changing my voice. He wanted a little variety and he said you can do something that will make people sit up and ask who the singer is. ``I mimicked a few voices and he liked the duplication of R. D. Burman. He asked me to continue to sing in the same voice. When I was recording something told me the song was going to be a hit the beat, the sound and rhythm. But I did not expect it to be such a success. I rendered that song in Tamil, Telugu and Hindi. It has given me new life. If in a year a playback singer gets the opportunity to sing three or four songs like this he can stay in the hearts and minds of the people. We sing so many songs but I am really happy to have sung one that captured the fancy of people both young and old. For that I am truly grateful to Rahman. Mano does admit that there is a strain when one sings in a different voice. But with my experience I am able to mask that strain. And it all melts once the song becomes a hit. But the real problem starts only then. Because when we do live concerts 0};3 we will have to render the song with the same verve in front of the audience. During a recording we can sing in bits and even if it does not turn out well we can bunch it and then mix it. We cannot do it in a live stage performance. If a song becomes a hit we will have to practice extra hard to render it with the same perfection during a live performance. Mano has had solid grounding in music having learnt Carnatic music for over four years from leading vocalist Nedanuri Krishnamurthy. He makes it a point to practice for 45 minutes every day. ``Once I do that I can sing any range without any difficulty. A versatile artiste Mano plays the piano and the harmonium which he learnt from his father who was attached to the Vijayawada station of All India Radio. He never misses live concerts as they are a great encouragement ``I am able to see for myself how people react to the song. Their applause is like a tonic and will keep me going for years. For Mano, born Nagoor Babu and rechristened Mano by Ilayaraja it has been a long and arduous climb. Success was slow in coming but he hung in there long enough to reach where he is today. The child of Shaheeda, a leading stage actress in Andhra and a musician father Mano was a child star to begin with although he was interested in music from a very early age. ``I have acted in lots of stage plays and had done about 15 Telugu films including ``Rangoon Rowdy and ``Kethu Gadda. In 1979 I was doing a Telugu film for which M. S. Viswanathan was the music director and S. P. Balasubramaniam was to sing for me. We were waiting for SPB to arrive and M. S. Viswanathan's assistant who happened to know my father asked me to sing. I sang a few ghazals and everybody said the boy has a nice voice. They listened to me on the monitor and M. S. Viswanathan asked me to come and join him in Madras. I completed my work in that film, abandoned my studies and worked with M.S. for two and half year as his assistant. Those were tough times. Mano was living in rented accommodation and used to sing in hotels for a payment of Rs. 35 per day. ``I used to save up all the money my parents sent me and manage with what I earned. Whenever I felt like eating a good meal I used to gatecrash into one of the numerous kalyana mantaps in T.Nagar. I would exchange the coconut they gave at the wedding with the vegetable vendor for some vegetables. Then in 1982 I went to Telugu music director Chakravarthy to ask for a chance for my brother who was a tabla player. We got talking and soon he wanted to try me. MSV readily agreed; besides Tamil was a bit of a problem at that point. Once I joined Chakravarthy my fortunes changed. I worked as an assistant and also used to render the dummy version before the main singers mixed their voices. I must have sung 2000 tracks for all the leading singers. In 1984 I got a break when a third voice was required and I sang along with SPB and Susheela in the film ``Karpoora Deepam. Then there was a brief lull. I sang for a Kannada film ``Hamsalekha in 1985. In 1986 I sang `Anne Anne' in ``Poovizhi Vasalile for Ilayaraja. Other hits followed with p73 ``Enga Oor Paatukaran (`Shenbagame,' `Madurai Mari Kozhundu Vaasam') and ``Velaikaran (`Vaa Vaa Kanna Vaa,' `Velayillathavan' etc.). Soon I became busy and requested Chakravarthy to relieve me. For the Vijayawada boy who came to Madras hoping he could at least make it as a keyboard player and wondering if he could ever meet Ilayaraja, actually working for the maestro was like a dream come true. Mano does not take any great pains to protect his voice which is his greatest asset. ``I eat ice cream, drink lime juice and ice water. The only must is his 45 minute practice session. ``If I get used to hot water and go somewhere where it is not readily available I will have problems. I feel the voice should get used to all kinds of weather conditions and food. He swims regularly as he believes that swimming underwater improves his breath control and his singing as well. Mano loves listening to (and singing) ghazals by Mehdi Hasan and Ghulam Ali of which he has a huge collection. Although most of the songs that he has sung are fast and racy and he has done a few semi classical numbers like `Athma Varaiyo' he believes he will do well even if he is offered a full-fledged classical song because of his firm grounding. Although he has sung a few Hindi numbers for Gulshan Kumar in ``Aaya Sanam, ``Aaja Meri Jaan, ``Kasam Theri Kasam, ``Chor Aur Chan, and would like to do more Hindi numbers Mano says the problem is leaving at short notice when there is a Hindi song recording. ``It is difficult for me to go and settle in Bombay at this stage. The success that he enjoys has not gone to his head. ``Everytime one succeeds or gets recognition one must take it as a warning to do better the next time. If one becomes arrogant downfall is certain, he observes. Right now Mano is not keen on picking up the threads of his acting career. ``Singing is my main vocation. A singer is half an actor. He must get into the mood, visualise the sequence, recapture the feelings of the hero as he stands before the mike.